When opening an application, it will check whether every element (data fields, pages, controls etc.) has been provided with a title in every portal languages. 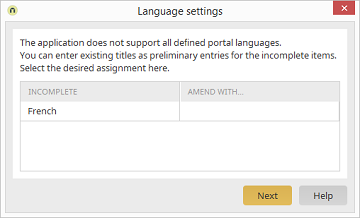 If you have, for example, activated an additional portal language, titles will remain blank to begin with. In this column, the languages which have missing titles will be shown. By clicking in this column, a drop-down list with the languages, which already have titles, will open. When you select a language here, the empty titles will be replaced with the titles defined in the selected language.